Mango season in the Northern hemisphere is April to October. One does not need special skills to eat the ripe fruit. Simply peel the fruit and bite into its juicy flesh. Many love to eat the raw skin of the fruit as well. Myself personally, I have never tried to eat the peel. Now days you can find the mango dried, or frozen. In both cases the mango is still sweet in flavor. You can juice the mango, which I have with fresh blueberries, what a yummy smoothie. You can make mango salsa and even in India they make Mango Jam. Mangoes do not grow in mild to cooler climates, they are grown in tropical regions of the earth. In 2012 the consumption of mangoes by Americans was up 30% over the prior 5 years. If you are familiar with NPR or National Public Radio (USA), they had a report the morning of April. 9, 2013 entitled “Demand Is High For Mexico‘s Magnificent Mangoes”. Take a moment to listen. Just Click Here to listen to the 1 1/2 minute NPR Report – another window will open to here report. Remove from heat and let cool. 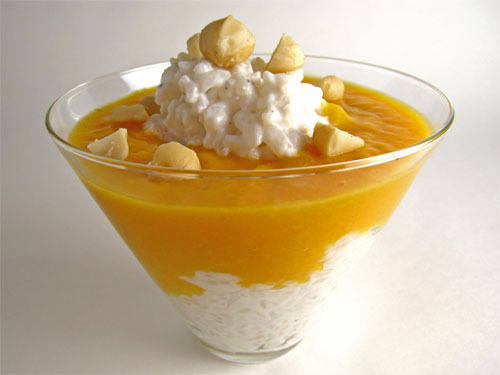 Mix in the mango and garnish with chopped macadamia nuts. Ingredients: A Note on Green Mango and Green Mango Powder. From The Archives. Kiwi, Mango, Pineapple, Coconut, and Kale. Wow that’s a mouthful. This entry was posted in Dessert and tagged Açaí palm, ABC News, Amy Hastings, April, Arborio rice, arorio rice, Associated Press, Baltimore, Berkeley, California, cardamon, Cinnamon, Coconut milk, Coconut Rice Pudding, Food, India, Macadamia, macadamia nuts, Mango, Mango season, mangoes, Mexico, NPR, Nutmeg, Rice Pudding, United States. Bookmark the permalink.